Sculptor and performance artist, Takashi Horisaki, a Japanese native currently based out of Queens, New York, will exhibit his first large-scale outdoor sculpture this summer under the Open Space program at Socrates Sculpture Park in Long Island City, New York. Horisaki will be continuing his Social Dress series, in which he creates fabric-like latex replicas of architectural surfaces, with Social Dress New Orleans – 730 days after by adapting the technique for a New Orleans shotgun-style house. He will re-visit New Orleans, where he lived for three years, to paint liquid latex onto the entire surface of a condemned house, carefully peel the latex off, and transport the latex “skin” to New York City. 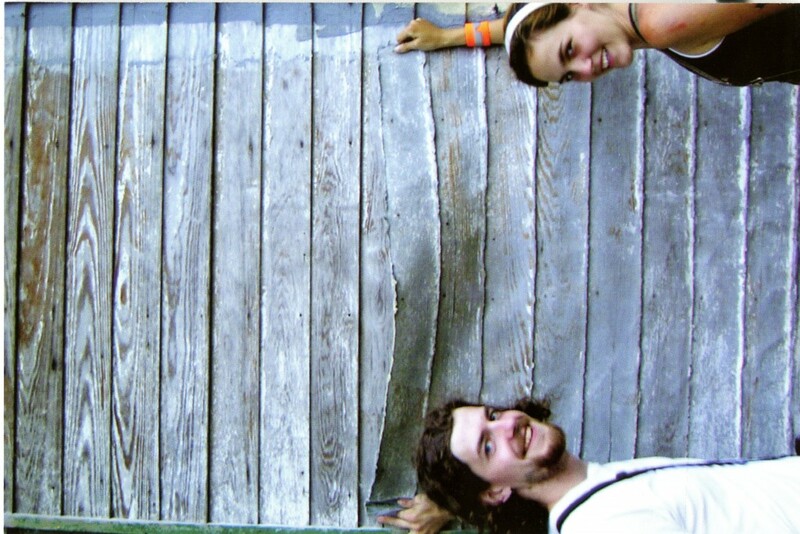 At Socrates Sculpture Park he will then construct a full-size skeleton of the house to be covered by the latex “skin” surface that was cast in New Orleans. 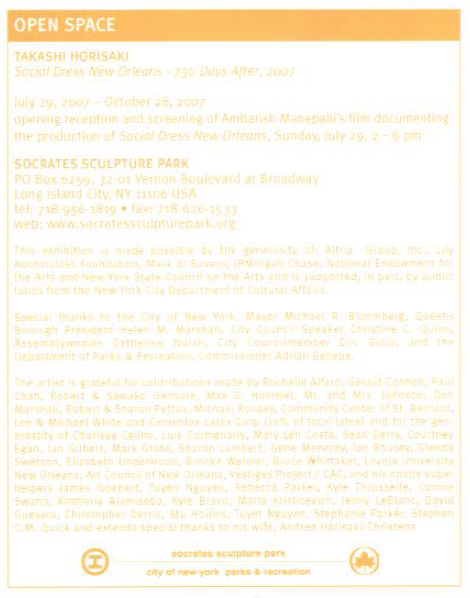 The opening events includes a screening of Ambarish Manepalli’s film documenting the production of Social Dress New Orleans. This exhibition is made possible by the generosity of Atria Group, Inc., Lily Auchincloss Foundation, Mark di Suvero, Modern Art Foundry, JP Morgan Chase, National Endowment for the Arts and New York State Council on the Arts and is supported, in part, by public funds from the New York City Department of Cultural Affairs. Special thanks to the City of New York, Mayor Michael R. Bloomberg, Queens Borough President Helen M. Marshall, City Council Speaker Christine C. Quinn, Assemblywoman Catherine Nolan, City Councilmember Eric Gioia, and the Department of Parks & Recreation, Commissioner Adrian Benepe. The artist is grateful for contributions made by Rochelle Alfaro, Gerald Cannon, Paul Chan, Robert & Sawako Gensure, Max G. Hommel, Mr. and Mrs. Johnson, Don Marshall, Robert & Sharon Pettus, Michael Rousey, Community Center of St. Bernard, Lee and Michael White and Cementex Latex corp (10% of total latex) and for the generosity of Charisse Celino, Luis Cormenaris, Mary Len Costa, Sean Derry, Courtney Egan, Jan Gilbert, Mark Grote, Sharon Lambert, Gene Meneray, Ian Rousey, Glenda Swetson, Elizabeth Underwood, Brooke Wehner, Bruce Whittaker, Loyola University New Orleans, Art COuncil of New Orleans, Vestiges Project/ CAC, and his onsite super helpers James Goebert, Tuyen Nguyen, Rebecca Parker, Kyle Throssell, Connie Swann, Kimberly Ajamiseba, Kyle Bravo, Marla Kristicevich, Jenny LeBlanc, David Guevara, Christopher Derris, Stu Hollins, Tuyet Nguyen, Stephanie Parker, Stephen C.M. Quick and extends special thanks to his wife, Andrea Horisaki-Christens.